Shhhh. I have a homeschooling mom secret. I really stink at geography. I mean, really stink. Let's just say that it's a good thing I live in a state that is shaped like a mitten and easily recognizable. My emphasis in our homeschool has been to learn how to use a map, as opposed to really learning state or country location. It's not that I don't think geography is important, because I do. Perhaps I have too many public school memories of geography memorization as being torturous. However, The Little Man in the Map has helped me see the study of geography in a new light. The Little Man on the Map, written by E. Andrew Martonyi and illustrated by Ed Olson, approaches learning geography in a whole new way. This 64-page hardcover book uses rhyme and visualization to help kids learn the location of each state of the U.S.A. Throughout the pages, MIM (Man Inside the Map) guides the reader by region through the states, which together create a United States like you've never seen before. MIM tells a story in rhyme about the characters and objects used to visualize the states in each region. To find MIM, use your imagination and look closely at the outline of Minnesota, Iowa, Missouri, Arkansas and Louisiana, where he's been for over 150 years. To keep them nice and stable. Next to South Carolina's wedge. Continuing with the technique, the rhyme further explains that each leg also has a letter assigned, representing the name of the state, which together spell MAGS (Mississippi, Alabama, Georgia, South Carolina). Some of the associations are stronger than others, but all will engage your imagination. Rhyme, visual aids, story-telling, and word association used for learning are mnemonic techniques. For many kids, especially creative or special needs kids, this type of learning is essential. For others, it is just plain fun. The Little Man on the Map would be an excellent book to supplement a U.S. geography study or perhaps to get the kids...or the teacher (ahem)... interested in one! Just when is that deadline for the National Geography Bee registration...? "Imagination is the magic key...To help unlock the clues you need ...To learn geography"
You can purchase The Little Man on the Map at for $19.95 directly from Schoolside Press. A 38 x 22 inch wall map in MIM style is also available for $21.95 or you can get both book and map in a combo package for $35. FREE SHIPPING is currently being offered for the holidays! Download the free coloring pages and watch a video about the book, both available on the home page. The author also has a blog, which he hopes will become an interactive place for kids and teachers to share interesting observations about our land. Be sure to check out more reviews on this product from the TOS Crew's Official Blog. Have you looked at the shelves of the local bookstore lately? I've been appalled at what has been passed off as decent literature for children. How do you determine what is appropriate among the hundreds of books on the shelves? You simply cannot judge a book by its cover! My 11-year-old daughter recently checked out a book from our small local library that obviously targeted tween girls. The pink cover touted an innocent cartoon girl with a cutesy title. However, within the pages were swear words and a scene with teachers skinny dipping! Yikes! Fortunately, in such instances, my daughter will not continue reading the book and promptly tells me what she discovered so that we may discuss it. Obviously, I'd much rather have a better filter for reading material. I used to preread books for my voracious reader, but I'm finding it impossible to keep up. Thankfully, Salem Ridge Press has come to my rescue. "Whatsoever things are honest, whatsoever things are just, whatsoever things are pure, whatsoever things are lovely, whatsoever things are of good report; if there by any virtue, and if there by any praise, think on these things. (Philippians 4:8)"
Using this standard, Daniel has several criteria for the content of his books. Stories of high moral standards and character are a must. Additionally, one of his first rules is, "No Kissing!" You will find no embraces or kissing in any of the Salem Ridge Press books. Also edited out are derogatory comments that are considered offensive, unnecessary and non-edifying. Illustrations are occasionally modified to keep to modest standards. Most often these changes are minor but bring stories of old up to the standard of Philippians 4:8. The TOS Crew was sent three titles for various ages as a sampling of what Salem Ridge Press offers: Glaucia the Greek Slave, by Emma Leslie; American Twins of the Revolution by Lucy Fitch Perkins; and Mary Jane, Her Book by Clara Ingram Judson. This title, the first in the Emma Leslie Church History Series, was by far my favorite. The first twelve of the series are currently available with a total of 25 titles in all planned. The series covers the history of the early church from the time of Paul to the French Revolution and the Methodist revivals. Without giving too much away, this story follows Glaucia, a young Greek girl who was sold into slavery to pay off her deceased father's debt. Greece and Rome during the time that Paul was preaching of Jesus Christ from the streets and jail is the setting. It is a wonderful historical fiction that truly gives you a sense of the time and the reaction and resistance of the culture to the Good News of Jesus Christ. I appreciate the historical notes, timelines and word definitions that are included in this series. This particular title often had words defined at the bottom of the page for a clearer understanding of the culture at the time while reading. Glacia the Greek Slave is 274-pages of substance, in content and length. My 11-year-old daughter thoroughly enjoyed it and I look forward to acquiring more from this series. Based on a true story, this title is an example of good character, determination, and sacrifice for one's country. Twins Sally and Roger, along with their mother and household slaves, help get much-needed supplies and gold to the Continental Army while under the suspicion of British spies. I especially liked that the whole family worked together to accomplish a big task. Young readers are sure to be impressed with the bravery of children in this story. This title would make a wonderful family read-aloud. For independent readers, be aware that some of the text of the household slaves is written in a deep Southern dialect and some readers may have trouble decoding these passages. I believe it adds much to the atmosphere of the story, similar to Mark Twain's writings, but did want to note for those intending to give this book to children to read on their own. This book is 204 pages, but with slightly larger text than the Emma Leslie Church History Series, which is likely better suited for younger eyes. Follow the everyday adventures of five-year-old Mary Jane in her home and town while her older sister is off to school. The simple stories in this title are sure to appeal to little girls who can relate to the thoughts and observations of the main character. While I don't see young boys being attracted to this story quite as much, they may be interested in Young Robin Hood, also offered for this age range. Mary Jane, Her Story is 183 pages long. Prereaders will enjoy it as a read aloud. The vocabulary is simple enough that children reading early chapter books should be able to read it independently. All in all, I am impressed with what Salem Ridge Press has to offer and look forward to future releases. Visit their website to explore titles by time period, location, title, author and age range. You can also get a heads-up on upcoming releases. At the website you will find a list of suppliers, which includes some of the well-known book suppliers as well as smaller homeschooling establishments. With Salem Ridge Press, you can judge a book by its cover! Not only are the covers wholesome, but the inside too! These would be excellent choices to supplement your history studies or just for pure enjoyment. Under the watchful eye of Daniel Mills, I would not hesitate to hand over any book published by this company to my children. For more reviews, please visit the TOS Crew main blog. For a limited time, Salem Ridge Press is offering a FREE download of Glaucia the Greek Slave in its entirety. Click here for details. The Missing Link: Found, the first of the 3-book The Truth Seekers Mystery Series, is the inspiration of homeschool student Christina Gerwitz that came alive through the encouragement of her mother, Felice Gerwitz. Christina, who was 14 when the first beginnings of this story took shape, approached her mother with the idea of writing a mystery novel. Felice responded by taking the leap right along side of her. Learning together, they co-authored this adventurous mystery with a Creation Science theme. This is certainly an action-packed book. By the fifth page, the main characters of the book have the automatic weapons of a FBI helicopter trained on them! The plot revolves around two homeschooled teens, who have a knack for getting themselves in dangerous situations, on an archeological dig with their father and cousin. Mysterious illnesses, strange threats, a rendezvous with crocodiles, kidnappings, and secret agents…twists and turns are throughout the book. As a reader outside the target audience and coming from an adult perspective, I had some trouble with some of the unrealistic nature of the storyline. The writing isn’t Newberry Award material, but still an accomplishment for a young teen. As a homeschooling parent, I commend this mother-daughter team for making this book a reality for tweens and teens to enjoy. I like that this wholesome book has Christian homeschooled main characters. Prayer and discussions of faith are throughout the book. Furthermore, The Missing Link: Found has a greater purpose than to tell a good mystery story. This book is intended to inform the reader on details and evidence that surround the Evolution/Creation debate. Creation Science is integrated throughout the story and well-backed up and researched. A glossary, references and resources are provided if the reader wants to dive into the topic further. I was curious to see what my resident 11-year-old tween would think of the book. While she typically does not read adventure stories of this type, Creation Science is a favorite topic. She also dreams of becoming an author some day. It was a quick read for her and she summed it up with the comment, “It’s like a Nancy Drew book with an Evolutionary/Creation twist!” She also enjoyed the surprise turns and ending. That’s two thumbs up from the target audience! The Missing Link: Found can be purchased at Media Angels for $8.99 or the 3-novel set for $22. In addition to The Truth Seekers Mystery Series, Media Angels offers online classes, writing DVDs, science kits, study guides and more. To read more reviews about this title, please visit the TOS Homeschool Crew's Official Blog. The Quest for Thunder Mountain Contest! 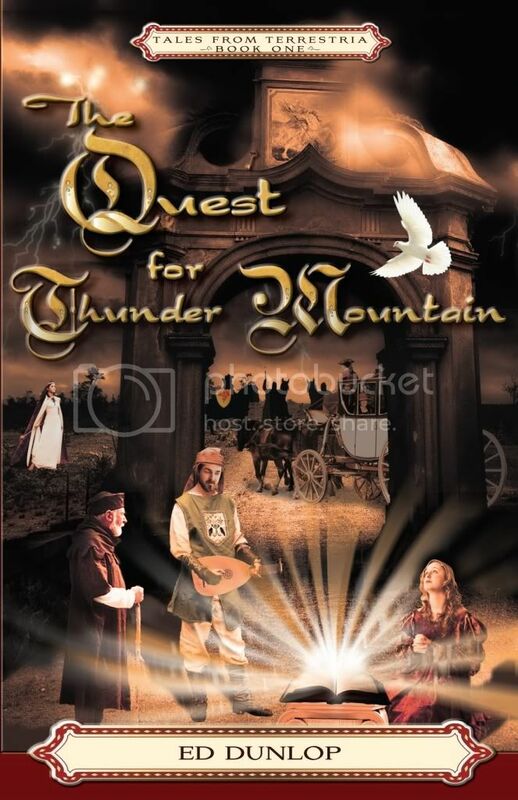 Win a copy of the Quest for Thunder Mountain, the first in the series Tales from Terrestria by Ed Dunlop. Click here for details!